G2 Crowd, the world’s leading business software review platform, today released the Fall 2017 Cross-Channel Advertising Software Grid report to help businesses make the best Cross-Channel Advertising technology buying decision. DoubleClick Digital Marketing, Marin Software, Sizmek, Kenshoo Infinity Suite, 4C, MediaMath TerminalOne Marketing OS™, AdRoll, and Rocket Fuel Programmatic Marketing Platform were named Leaders in the report, receiving a strong customer satisfaction score with a large market presence. 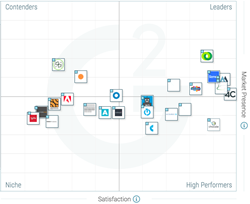 Choozle, Quantcast Advertise, Acquisio, The Trade Desk, and CAKE were named High Performers in the report, earning strong customer satisfaction marks with smaller market presence scores. 4C earned the highest overall satisfaction score while DoubleClick Digital Marketing earned the highest overall market presence score. This report also breaks down the Cross-Channel Advertising category, based on market presence and customer satisfaction score, for Small-Business, Mid-Market, and Enterprise reviewers. At the small-business level, Choozle earned the highest overall satisfaction score and DoubleClick Digital Marketing earned the highest overall market presence score. In the mid-market segment, 4C earned the highest overall satisfaction score while DoubleClick Digital Marketing earned the highest overall market presence score. Finally, at the enterprise level, 4C earned the highest overall satisfaction score while DoubleClick Digital Marketing earned the highest overall market presence score. Tightened focus on what qualifies as video functionality — Vendors have become more discerning in the channels where their product can offer capability. Video advertising is becoming more expansive and far-reaching, and products need to be able to withstand required best practices to succeed. Yet, the overall user satisfaction average for the “video functionality” feature has dropped since the Spring 2017 Cross-Channel Advertising Grid℠ Report: the average was 80% and now it is 78%. A possible explanation would be that users are becoming more critical about products’ actual ability to create, buy, and manage video advertisements. Improvement of products’ mobile advertising capability — In the Spring 2017 Cross-Channel Advertising Grid℠ Report, the overall average for “mobile rich media capabilities” was 75%. In the Fall 2017 Cross-Channel Advertising Grid℠ Report, the overall average for that same feature function increased to 78%. In this report, seven vendors specifically denoted that they do not offer mobile rich media features. Increased dependence on DSP capabilities — In order to qualify as a cross-channel advertising product, a software platform must offer capabilities across three or more digital advertising channels. A software tool doesn’t necessarily have to integrate or offer a demand side platform (DSP) within its offerings, but users take note when it does. The opportunity for advertisers to buy advertisements in real time is necessary for them to retain the attentions of their consumers. When products’ DSP functionality works across a variety of devices, then users are pleased and their reviews show it. In the Spring 2017 Cross-Channel Advertising Grid℠ Report, the overall average for cross-device capabilities was 77%; in the Fall 2017 Grid℠ Report, the overall average is 79%. The report is based on more than 1,607 reviews written by business professionals. Of the 54 products listed in G2 Crowd’s Cross-Channel Advertising category, the ranked products each received ten or more reviews to qualify for inclusion on the Grid.